a valuable part of their chamber membership. 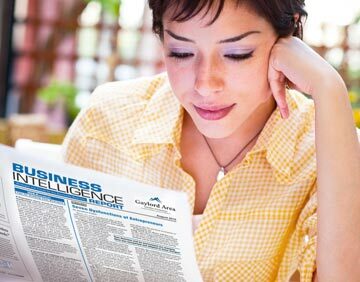 Free Sample Issue: View a sample copy of the Business Intelligence Report. Combined surveys of chamber members across the U.S. shows that an average of 79.4% of repondents thought the Business Intelligence Report was a valuable part of their membership. Business owners often feel that chambers don't do enough for them. Offering the Business Intelligence Report demonstrates that you care about the success of their businesses. In addition to paid members, you can distribute up to 150 extra copies each month to potential members. Let them know that this is a benefit they'll receive by joining your chamber! Our e-mail template is compatible with common e-mail service providers. You can also print and mail each issue or even insert it into your existing newsletter. We search through more than 150 business sources to provide the best news, trends, tips and stategies. We filter out the fluff, saving members countless hours of reading time. If for any reason you aren’t satisfied with the Business Intelligence Report, we will cancel your agreement and refund your money for that month's issue. Members love the valuable benefit. You'll love the impact on membership. Is this scenario familiar to you? Your members are demanding more benefits to justify their chamber membership dues at the same time your budget is getting smaller. You provide networking events, seminars, workshops, discounts and expos to meet their needs. In the end, most don’t use these benefits, and some will quit, claiming that the chamber didn’t offer enough. 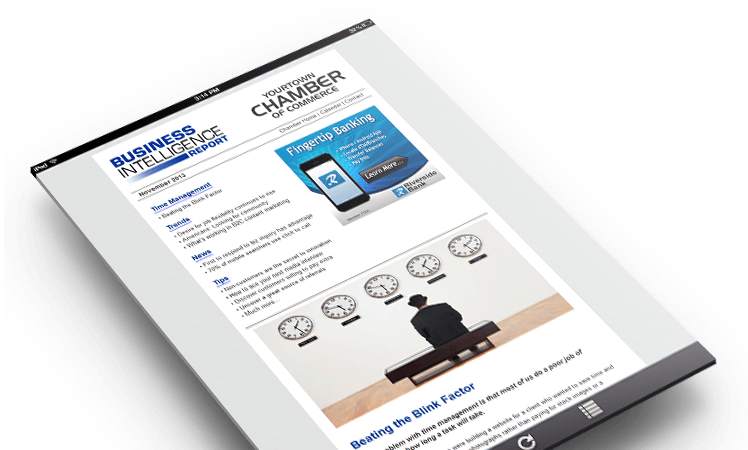 These were the challenges presented to us when we talked to chambers of commerce across the U.S. Our company met these challenges by creating the Business Intelligence Report, a chamber of commerce newsletter developed from member feedback. When members succeed, the chamber succeeds. The Business Intelligence Report is a nationally distributed, quick-read resource that provides business professionals with the latest strategies, trends, tips and news for today’s business. Each issue contains business strategies to help your members run their businesses more effectively. However, we're more than just another source of information. We base the content of this report on what business owners say they want in a business publication, and we regularly conduct surveys to ensure that the report continues to meet their needs. Think of us as an information filter. While other publications add a certain amount of "fluff" to fill their pages, we extract only the best ideas from hundreds of sources. We then pare down that information again and again until only the most helpful strategies, trends, news and tips are left. Finally, we summarize only the main ideas from the original sources. For members who want a more in-depth look at a topic, we include one full article by a business expert. Overall, this approach allows you rmembers to discover practical business ideas while avoiding the mind-number deluge of information currently online and in print. When you join our Chamber Program, we’ll provide your chamber with a personalized master copy of the Business Intelligence Report to distribute to your members each month. You can e-mail it, print it or offer the publication on a password-protected area of your website. Depending on the size of your chamber, you will be able to provide the Business Intelligence Report as one of your chamber benefits for between 10 to 35 cents per member per month. That's 93 to 99% off the single subscription price, and it's an investment that should more than pay for itself in retained member dues and goodwill. We do allow corporate sponsors. "We consistently receive positive feedback on the publication. Print or Email It to Your Members. It's Mobile Friendly! You can even insert the content directly into your existing chamber newsletter.